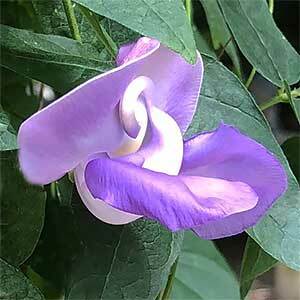 Very attractive and interesting flowers, the Snail Vine is Vigna caracalla (syn. Cochliasanthus caracalla). This is climbing plant from tropical to sub tropical areas where it can be evergreen. Usually grown as an annual, or perennial in colder climates. In warmer areas the plant will flower almost year round. It is the shape of the flower that gives the plant its name, they spiral like a snails shell. The flowers are followed by seed pods if the appropriate pollinators are around, and these are ants that are attracted to the flowers. As the plant grows in late spring to summer it needs to be pruned back to encourage good flower formation. This is not a problem as this is a fast growing plant and it recovers quickly. We think the height should be restricted to around 2 metres at the most. Keep moist through the spring toand summer. This is a vine that will grow well in a container if required. In warmer climates reduce the size to 1 metre in winter. In cooler areas it will die back. Easy from seed sown in spring. Common Name – Snail Vine, Corkscrew Vine. Height – Can reach 5 metres. Spread – This a climbing plant and vigorous. Flowers – Green to white then turning to mauve with pale pink.